What do initials after an instructor's name mean? Click here to find out. Growing up with dogs, cats, guinea pigs, and rabbits, there was no way Kathe Baxter could not love animals! She has pursued her love of animals as a trainer and pet caregiver, training in K9 Nose Work, basic and advanced classes as well as pet therapy preparation and visits. Completion of her Professional Dog Trainer Certification (CPDT-KA), Certified Nose Work Instructor (CNWI), and Karen Pryor Certified Training Partner (KPA-CTP) were all extremely rewarding. In K9 Nose Work, Kathe's Norwegian Elkhound "Little Lady Karita" was the first Elkhound to earn all three levels of Nose Work competition (NW1, NW2, NW3) as well as one of 11 teams to earn the first Elite titles in the Northeast. They qualified and attended the NACSW National Invitational two years in a row (2014-2015) and are on their way to qualifying for the next National Invitational to be held in 2017. Kathe achieved a NW1 and NW2 title with her dog Gunner; however, he was unable to continue his Nose Work career due to his untimely passing. Kathe's passion for instructing is based on the sheer delight of bringing true joy and happiness to a person and their canine companion. She considers it an honor to be part of developing self-confidence and a genuine trusting relationship. Kathe is a staff member of NACSW, holding the position of National Trial Coordinator and Certifying Official for NACSW trials. She hosts many sanctioned trials and held several primary positions as volunteer coordinator, score room lead, ORT Coordinator and ORT Judge. In addition to being an active competitor in Nose Work, Rally, and Agility, Kathe is a member of the Hudson Valley Tracking Club, pursuing tracking and participating as a trial tracklayer. Most gratifying were weekly Therapy Dog visits and, time permitting, working at the local shelter to help other dogs get a second chance. Kathe takes continuing education very seriously, attending seminars, workshops, trials, and observing K9 teams as they search: detecting search patterns, environmental factors and the subtle body language of communication. This is invaluable knowledge and skills she passes on to handlers and their dogs. Kathe can be reached at baxterkworks@gmail.com. George Berger has had a lifelong passion for and involvement with dogs through obedience, Nose Work, and therapy dog training. He is a member in good standing of the Association of Pet Dog Trainers (APDT). At PCOTC, he is teaching Nose Work and Therapy Dog classes. For several years, George has been doing canine-therapy work, first with his Labrador/Golden Retriever, Dixie. The pair made over 500 visits at New York-Presbyterian Hospital, the pediatric units at Roosevelt and Bellevue Hospitals, and the Hallmark Assisted Living facility, all in the New York metropolitan area. Now, George's second dog, Paco, a Chihuahua mix, has become certified and has 200+ visits worth of experience. Berger coordinates the therapy dog program at New York-Presbyterian Hospital in White Plains, and is the trainer for that program. He and his dogs have been certified/registered by the Delta Society, the Good Dog Foundation, and Intermountain Therapy Animals. Berger was Publisher of AKC (American Kennel Club) magazines, 1999-2006. He has served as President of the Irvington (NY) Public Library, The O'Hara Foundation, and the Otsego County Society for the Prevention of Cruelty to Animals. He is currently on the advisory Board of National Education Assistance Dog Services (NEADS), was President and is now Second Vice President of the Port Chester Obedience Training Club. Kathy was born into a family that bred Boston Bull Terriers. She met her first Doberman while in college and has shared her life with this breed ever since. She is a member of the Doberman Pinscher Club of American and the Long Island Doberman Pinscher Club. An active member of PCOTC since 2003, Kathy served on the Board of Directors from 2006 to 2015 and as CFO and Treasurer for seven of those years. Kathy was also Board appointed as AKC Delegate from PCOTC in 2015. Kathy's dogs have achieved many titles in conformation, obedience, agility, and nose work competitions. Her red boy, Dante, was the first of his breed to achieve a NW3 title. Kathy has been an avid Nose Work enthusiast since taking the first Nose Work seminar given at PCOTC in 2010, and has been teaching Nose Work at PCOTC since 2013. Her students have included old dogs, puppies, blind dogs and retired agility dogs. Kathy believes that any dog with a nose can enjoy Nose Work, and that this sport supports shy, sensitive, and environmentally challenged dogs as well as dogs that just like to get out and have fun with their handlers. And some of Kathy's students are successfully competing at the highest levels of Nose Work. Kathy has been invited to give Nose Work seminars as fund raisers for two different breed clubs in New York and New Jersey, and several animal shelter groups. Kathy's application has recently been accepted to be an AKC Scent Work judge. Cynthia Grohoski is a Certified Nose Work Instructor (CNWI™). She has completed hundreds of hours of additional education and training via participation, with two dogs, in six years of K9 Nose Work® classes, camp, workshops and seminars taught by K9 detection professionals on topics such as scent theory, K9 olfaction, subsurface and buried hides, Mental Management® for nose work competitors, and dog handling methods. Previously, Cynthia was a class assistant for PCOTC’s nose work classes, and lead instructor for CGC/TDI test prep classes and Intro to K9 Nose Work classes in Stamford, where she also does private coaching for nose work teams. 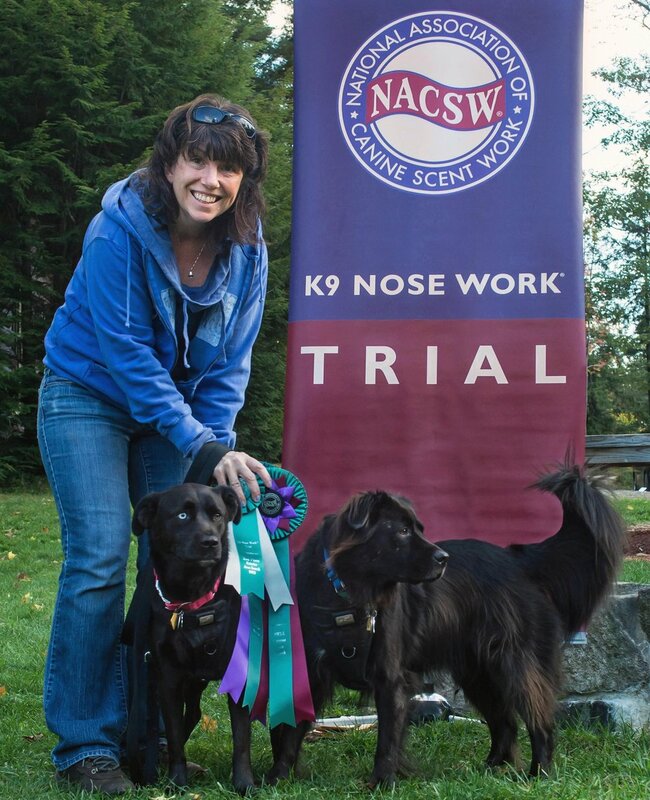 Cynthia is a nose work trial judge for United States Canine Scent Sports (USCSS). In 2017, Cynthia became the first individual in Connecticut to be licensed by the AKC to judge its Scent Work trials, and is approved to judge all levels and classes for these AKC events. She volunteers regularly at NACSW ORT’s and trials. Cynthia’s “Blossom” and “Emma” have earned NACSW’s NW1, NW2, NW3, NW3 Elite, ELT1 and ELT2 titles, all four NW3 Element titles, NW3-C, NW3-I, NW3-E, and NW3-V, Element Specialty Titles L1-C, L1-I, L1-E and L2-C; Emma has also earned the L1V title. In USCSS, Blossom and Emma have earned the DDCN titles, Emma the IN title, and Blossom the EN and CN titles. Blossom and Emma have earned more than 30 titles in CPE agility trials and the Novice Trick Dog titles from the DMWYD organization. Emma is an AKC Canine Good Citizen. Kathie has loved animals all her life. Through years of observation and education, Kathie has become interested in the bond and understanding that develops between a handler/canine team through training and playing together. Her introduction to scent work started at an introductory workshop at PCOTC in 2010. It was clear her dog, Shorty, loved it. Kathie continued her education in Nose Work by attending camps, classes and workshops, and trialing when time allowed. In 2017, she par- ticipated in the Certified Nose Work Instructor training course. Kathie believes all dogs and all handlers can improve their skills and their bond through training together. Helping teams partner and be successful is one of the reasons that Kathie has taken her passion for training with her own dogs, to helping others attain their training goals. She has competed in agility, nose work and freestyle with her dogs. She knows great dogs come in all shapes and sizes, and has volunteered with Metropolitan Maltese Rescue and American Bouvier Rescue League. She is secretary for Bouvier Owners of New England. Kathie has completed Karen Pryor Academy’s Dog Training Professional course, and the Certified Nose Work Instructor Course. She is a member of the Association of Professional Dog Trainers. She is an evaluator for the AKC’s Canine Good Citizen Program and an approved judge for United States Canine Scent Sports (USCSS). Kathie can be reached at krrn27@yahoo.com. Karen is a Certified Professional Dog Trainer Knowledge and Skills Assessed, a professional member of the Association of Professional Dog Trainers, a Certified Nose Work Instructor and is certified by Sue Sternberg for the CASA shelter dog program for Training Wheels and Train to Adopt. Karen has been teaching for PCOTC since 2003. Helping handlers to understand their dogs and build that all-important trust is key in Karen's teaching. Karen's philosophy is using hands-off training as much as possible, using positive reinforcement, operant conditioning and reward-based training. Karen completed her Certified Nose Work Instructor training in June of 2011. Providing nose work to shelter dogs is another very rewarding experience for Karen. This sport helps the shelter dogs by decreasing stress and keeping their minds active, using their innate scenting abilities. For many shelter dogs it helps them present better to potential adopters, since they are less stressed in their kennels. She has been the volunteer dog trainer for the SPCA of Westchester located in Briarcliff Manor, NY since May 2001. Karen was the founder of the SPCA's Lead The Way program (teaching the public to walk, socialize and teach basic behaviors to the shelter dogs, increasing their adopt-ability). She also evaluated dogs for the Golden Outreach Program run by the shelter. Karen has attended the APDT Conferences yearly since 2001 and has attended various Clicker Expos and many seminars over the years. Jessica was one of the first Nose Work instructors certified on the East Coast and has been teaching Nose Work classes since 2010. She has been the ORT National Coordinator for the NACSW, as well as the editor for the NACSW newsletter. Besides being a Certifying Official (CO) for NACSW trials and ORTs, Jessica has spent hundreds of hours volunteering at trials and ORTs. Jessica is also a licensed AKC Scent Work judge, approved to judge all levels and classes for AKC Scent Work trials. She has been a guest instructor twice at the Pennsylvania Nose Work camp and is currently the Scent Work instructor at Camp Unleashed in the Berkshires. Jessica is also an evaluator for the AKC CGC and Puppy Star programs. She has completed the rigorous IAABC Practices and Principles course. Jessica competes with her own dog, Trix in Nose Work, Rally, and Freestyle. Trix currently has two NW3 titles as well as her Element Specialty Titles L1-C, L1-I, L1-E, L1-V and L2-E and L2-C. Trix also has her L1 World Cynosport Rally title, a Novice Rally-FrEe Title, and her Entry Musical Freestyle title. Jessica works with Instinct Dog Training and Behavior in NYC teaching manners, obedience, and solving behavioral issues for dogs and their people. She believes in training that is effective, practical, and fun for both dogs and their people. You can reach her at trainingmattersnyc@gmail.com. Mary has always had a passion for animals. When she adopted Emily and Daisy, it blossomed into a full- fledged love affair with dogs. After completing Canine Good Citizen classes with them, she craved more. The trio enrolled in Nosework courses at PCOTC in 2011. The challenge, teamwork and sense of gratification were felt instantly. After a few years actively working through the nose work ranks, she began to entertain the idea of teaching, hoping to bring the joy of nosework to others. Mary completed her CNWI Training in 2017 and has dedicated most of her free time to learning everything she can about nose work and dog training. She is certified as an AKC Scent Work judge for Novice and Advanced levels, as well as a USCSS judge. Prior to obtaining her certifications, Mary enjoyed volunteering for many trials, as it gave her ample opportunity to observe and learn. She has found that the trust formed between dog and human through nose work can help rehabilitate even the most fearful or reactive dog. With Emily, she has earned the NACSW Elite Champion, earning the Harry Award in the process. With Daisy as her competition companion, she has earned all four NW3 elements titles, currently working on their NW3 title. Mary does caution that the bond you will form with your dog is highly addictive and it will bring your relationship with your furry friend to a whole new level of awesome!